Since connecting with Communities@Work, the journey has been extremely rewarding. The management team, staff and volunteers all share a similar vision for creating a better Tuggeranong and the partnership has given us a greater opportunity to support those doing it tough in our backyard. The Community Pantry is a connection to community that otherwise may not exist for many. It can be the difference between eating and not eating. We have staples, including fruit, bread and vegetables as well as hygiene products and pre-made meals. It’s also the social connection that is so vital; not being judged, having choices and feeling supported. It is truly life changing for many people in the community. People are so grateful and often tell us that they don’t know what they would do without us. I feel so privileged to be part of an organisations that identifies need and takes it upon itself to help. It surprises our donors that with the amount they may spend on a weekly shop ($250-$300), we can buy a pallet of food from FoodBank. With the $1,585 from Independent’s Cubby House fundraiser, we were able to buy 5 pallet of food for our community pantry, which helps support us over an entire week. Communities@Work’s CEO Lee Maiden has been working at Communities@Work for over 30 years, and has seen first-hand how important community is. I am always so proud of the way the Canberra community rallies around and supports each other, particularly when someone is going through tough times. 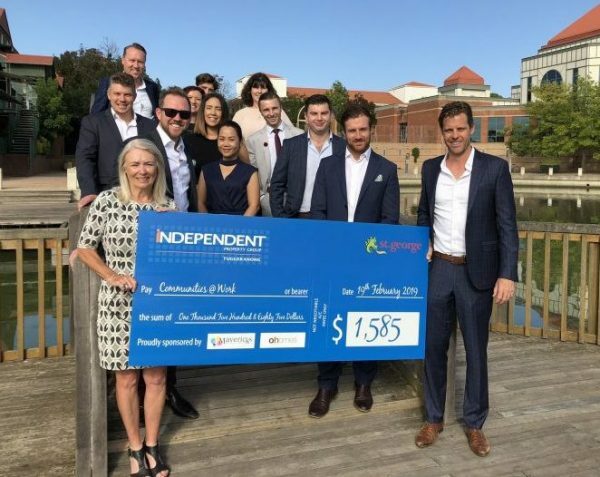 Independent Tuggeranong have partnered with Communities@Work for many years, raising thousands of dollars to support us to operate our community pantry and other programs for Canberrans experiencing hardship. Independent Tuggeranong and Communities@Work have a shared purpose, which is building a socially inclusive community and focusing on the wellbeing of those in the community. I look forward to continuing this great partnership. What is Communities@Work’s Social Impact? Communities@Work has a long history and deep roots in the Canberra community, with a commitment to helping make Canberra a strong, healthy and inclusive community where everyone can reach their potential, make a contribution and share the benefits. As Canberra’s largest not-for-profit social enterprise, Communities@Work provides complementary services right across the Canberra community. These services are critical to the social fabric and create positive social outcomes from birth to senior years. Communities@Work educates thousands of children across Canberra through high quality children’s services. Improving the learning, development and well-being for all children, particularly the most vulnerable, is at the heart of Communities@Work purpose. Communities@Work delivers nationally recognised Early Childhood Education and Care qualifications and invests in the next generation of high quality education professionals through our ASCEND Program, a unique traineeship model that provides an exceptional learning experience. Communities@Work understands the importance and value of training quality educators to deliver quality education and care right across the sector. Communities@Work supports hundreds of people in the Canberra community who are suffering hardship with food, clothing, shelter and other critical services. Communities@Work supports people from crisis to confidence. Communities@Work provides a variety of services for seniors including in-centre and in-community activities and improves the capacity of people with a disability to exercise choice and control, with programs for children, teens, young adults and adults. Communities@Work educates disengaged and vulnerable young people in Years 7-10 for whom mainstream schooling has struggled to deliver positive learning outcomes at the Galilee School. Children with poor educational outcomes are at an increased risk of experiencing life-long negative impacts, such as reduced employment prospects, poor health outcomes and reliance on welfare. The Galilee School inspires young people to realise their full potential and nurtures students to mature into responsible young adults with successful futures. Communities@Work works in and with the community to create a positive social impact. Communities@Work is grateful for the generosity of the Canberra community who help us support people who are suffering hardship and ensure the pantries are stocked with nutritious food all throughout the year. If you are interested in finding out more, please visit the Get Involved page, which has ideas and suggestions for both individuals and businesses who want to get involved, as well as a contact form to get in touch.